I am trying to find out what oil filter element I should get for a 3.5 lire engine. There were 3 types of oil filters used on the 3.5 100’s. I have the early type made in 1937. According to my parts book, the part number is OF.2152. Dimensions are close to 4’’ long. 2.5’’ outside diameter. 1.2’’ internal diameter top and bottom. Both ends are open ended. OK, I found a post from last year. It appears I need a WIX 57062. All is good. I just made up canisters to suit . 3 1/8" tube which was a common oil fiter size for BMC cars. I bought NOS Mini canisters. Had a plug lasered and machined for the bottom and can use the common Ryco RP 250 , or local equivalent. No one will tell unless they climb under the car with a tape measure. I did get a bit oy racer on the blown car and had aln alloy one made Aluminium tube is available in the size] I had to buy a minimum length so I can offer cut off and top turned over tubes free. Picture of the longer canister. Sorry bout the chassis being partly in the way. I have a wix filter coming tomorrow so I will give that a try first. I do have xke filters here, and as you say, they are very similar, but too long. Can you tell me if the carbs have spacers between them and the cylinder head, or do they bolt directly to the head? I also need to find the oil feed banjo bolts. I think the one that goes in the lower left hand side of the block is a BSF banjo bolt, maybe I could use a motor cycle one, but I am not sure what the thread is on the banjo bolt at the back of the cylinder head. Any idea on what to use? Remember the filters supplied for an EType may probably not have the large square section seal that the pushrod engine uses. I will have to make the carb spacers. Could you let me know how thick they should be? I am most appreciative for your help. 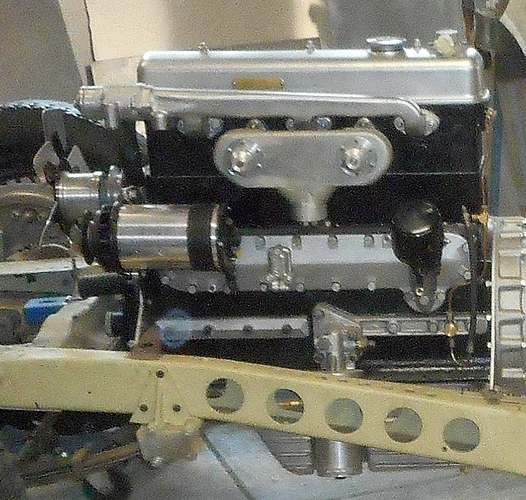 C.347 Distance Piece, between cylinder head and carbs. Used on all 3.5 L up to and including Mark V, so there should be some in somebody’s stash. They are made of 11/16" aluminum. Or Moss Motors sells a plastic spacer 372-030 listed under AH-100, TR2 & MGTF parts. They are 3/8" thick so you would want to get 4 of them and 6 gaskets. Probably the idea of the non-metal part is it doesn’t transfer as much heat to the carbs as the aluminum does. The spacers, non-metallic, are also stocked by burlen.co.uk. 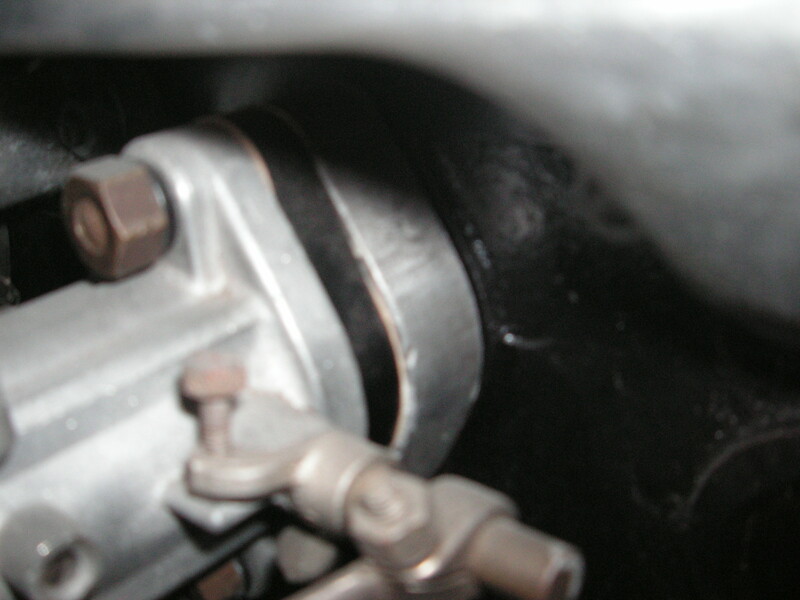 MGTTypes had 1 1/4” carbs so the main hole and the mouting holes will be quite different. That would explain why the Moss listing is only for TF which had H4’s. 1 1/4’’ are H2’s. 1 1/2’’ carbs are h4’s. 1 3/4’’ are h6’s. 2’’ carbs are h8’s. I think I will need the 372-030 spacers. according to the pics and measure, they should be the ones. It’s not just the diameter of the intake opening . it’s the spacing of the mounting holes. AS they list it for MGTC which has 1 1/4" carbs, I can’t see how that will work. Has you r head got the longer carb mounting studs? Perhaps there’s a mistake on a web page somewhere or something. The page I’m seeing says it’s only for TF and MGA, also TR2 and BN1&2.